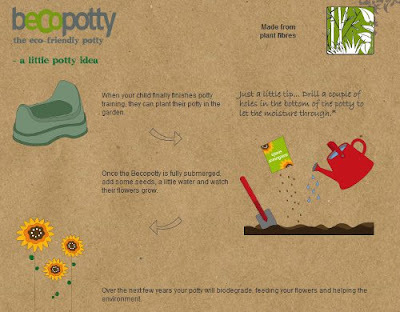 I was recently sent a Beco potty by Becothings, a company producing ecofriendly products. Derin has just turned two and is showing some signs of readiness for potty learning. He is not quite happy to sit on the potty yet but at least with the potty being in playroom he is getting the idea. I was always try to steer away from plastic products. Potties are always made of plastic and after a few months of potty learning they are just thrown away, just another plastic product added to the landfills. Enter the Becopotty. It is made of sustainable plant fibre material and 100 % biodegradable. When the child is done with it, you can simply plant some seeds in it. It will degrade over time while you nurture your plant. As an added bonus, it came with a packet of sunflower seeds! How thoughtful is that! Becco potty comes in three colours: Neutral,pink and blue. It is designed for babies 12 months onwards. Becco potties are sold at RRP £9.99 and are available online or at John Lewis and Jojo Maman Bebe stores. Becothings has other ecofriendly products as well, like Becosteps,trays,feeding sets. Check them out here. Disclaimer: We received a Becopotty for review purposes,all opinion my own. We've gone straight to toilet training - one of the reasons being that I didn't want yet another piece of child related plastic in the house. This is the kind of potty that would've made me think slightly differently and if we weren't already almost there on the toilet front, I'd be grabbing one! Does the pee stay in this thing? It seems like for a girl it might work well, but for a boy, the sides look a little low. Does the pee spill over?